Needle felting is something that I’ve wanted to try for a couple of years now. The trouble was that I just didn’t know how to get started, and the answer came to me last week in a kit that was gifted to me for my birthday. I just completed it this morning and I took photos throughout the process so that I could write a step by step entry illustrating what I learned as it all came together. The kit is Dimensions brand and the name of this specific set is “Monster”. It’s readily available in the UK as well as the US. 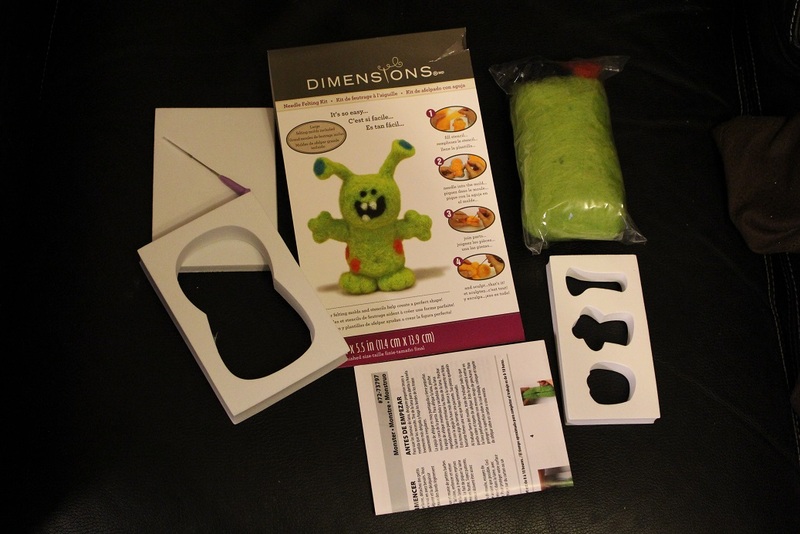 The kit comes with everything you need to make the little monster. (I call mine Lumpy) The best part about this set is that the molds are reusable so if you pick up some more wool you can make as many of these guys as you want to. It also makes the price seem a bit less steep knowing that it’s not just a single use thing. The instructions advise that the kit will take between 8 and 10 hours to complete. Upon reading that, I thought that they were massively overestimating the time it would take to complete the monster. As it turns out, I was mistaken. 8-10 hours is almost an underestimate. It took me 4 days to complete Lumpy. I just worked on it whenever I had a few minutes so I wasn’t able to time myself very accurately but I’m pretty sure that It probably took me over the 10 hour mark cumulatively. The instructions that come with the kit are illustrated and they’re very clear in telling you what to do as well as the texture and firmness that should be achieved. I admit, I didn’t quite trust them but I did what they said and it all worked out so they must know what they’re talking about! Needle felting requires a lot of monotonous, repetitive stabbing with a tool that looks like a pick. there are tiny (not sharp) barbs on the pick that catches the wool and mats it together. The tip of the pick is very sharp and you really need to pay attention to what you’re doing because carelessly stabbing yourself is a pretty realistic possibility… I only drew blood once! The nice thing about the pick is that the top end has a nice rubber bit so that you’re not brusing your finger while you are tapping down into the felt. It’s really quite comfortable. The first mold (white foam) is just to get a rough shape together. The second mold (blue silicone) is to solidify and measure the exact amount of wool required to make a half monster. I know now that I could have made my monster’s body a lot more firm. Being 100% inexperienced I just did what I thought was correct at the time. If I was to make another monster I’d needle the body until it was rock hard. And by rock hard I mean, quite firm… because this is felt, not cement. After two body halves are created you needle them together. This part is especially tedious because there is a seam and it’s not particularly cooperative in coming together. I found that if I squashed the two halves together and just stabbed the heck out of them at the edges they finally stuck. I think the biggest issue I had was that I was far too gentle. After the body halves are together it’s time to start stabbing the appendages into existence. I actually started this step before I had the body 100% sorted because I needed a distraction. There is a white foam mold that has holes for feet, arms and antennae. You need to use it twice to get all the bits. 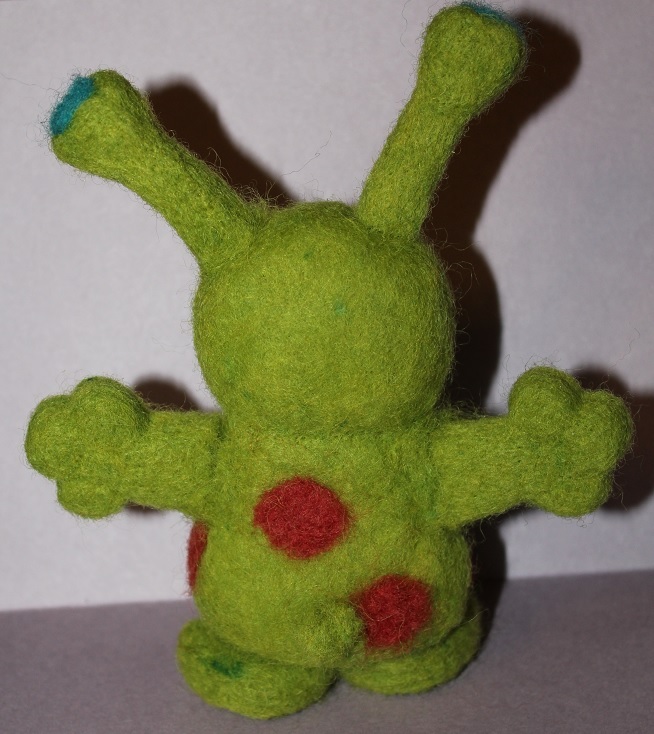 One mistake that I made is that I didn’t divide my remaining (after body) green felt equally so my feet and antennae didn’t come out even, then I needed to backtrack and add more felt onto the first batch. I would suggest to anyone trying this kit themselves that they split the felt into two even piles before they embark on the task of making body parts. This picture shows the difference between how the bits look straight out of the mold (top row) and how they look after they’ve been sculpted (bottom). Sculpting is the most time consuming part of this whole project because your tool is basically a needle. you’re sculpting shapes using a stabbing motion with something as thick as a needle. That means thousands of stabs. And just when you think you’re finished sculpting… you realize that you can do better and continue stabbing. The most important part about sculpting these things is you want to leave the part where it’s going to attach to the body fluffy so that there are fibers to drive into the body. After all of the body parts are done it’s time to shape the body and attach the appendages. If you left fluffy edges, this part will be a breeze, if you did not… you’ll suffer for it. The main issue I had was with the arms. Once they were attached I realized that they were too long. I think they just elongated while I was shaping them to make them firm and I didn’t notice. This frustrated me to the point that I pulled off Lumpy’s arms and trimmed them. Then I reattached them but because I had trimmed them I didn’t have any fluffy bits to help bind the arms to the body and I had to use a tiny bit of green wool that I had saved to bring it all together. Otherwise this project would have been a complete (armless) disaster. The good thing that came out of trimming the arms is that I used one of the arm trimmings to make it an adorable tail which wasn’t in the original pattern. Once all appendages are attached you get to add in the details. By this point I felt quite confident having spent multiple hours shaping the body, so adding in the details was a breeze. You just gather little tufts of wool and stab them into place. It’s really the easiest part of the whole project. I genuinely enjoyed making this project and I fully intend to make at least a couple more monsters. The best part was having such a thorough starting point. I learned so much about needle felting and sculpting and I can’t wait to apply what I’ve learned to new projects. As a side note, this is a fantastic kit for adults as well as children and you don’t have to have a lot of crafting experience at all to complete it. The only thing I would suggest that you keep in mind if you are purchasing it for a child is that the needle is very sharp so it’s probably best suited for a supervised 8+. This is great! I have always wanted to give it a try and I found a panda kit. It was a lot of fun but really time consuming however I enjoyed it very much. My panda did not come out a panda sadly, more of a lopsided penguin lol! That is okay though, I am going to try again! I loved you’re pictures through out the process!